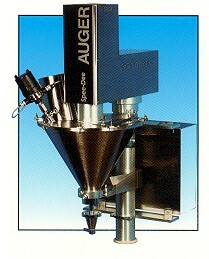 We offer a variety of Vertical Auger Filling Solutions to meet your filling needs. These auger fillers are often used manually, but can also be integrated with VFFS Machinery, Roll Baggers, ZP-300P Bagger, or Indexing Conveyors. Vertical Auger Fillers are ideal for portioning any non-free flowing materials: Bakery Mixes, Creams, Pastes, Lotions, Pharmaceuticals, Industrial Chemicals, Soil Products, Ground Coffee, Grains, Mushroom Grow Media, Hardware, ...into bags, bottles, cans, tubes, jars, cartons, etc. and economy of a Linear Net Weigh Scale System - Click Here for Details! Slow Speed Hopper Agitation Motor with Stainless Steel Agitator Blade.